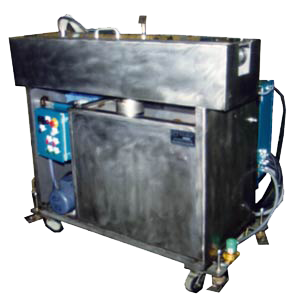 The above system is a hot water wash and cooling tank combination system used for removing salt from an extrusion and then cooling the extrusion prior to cutting. 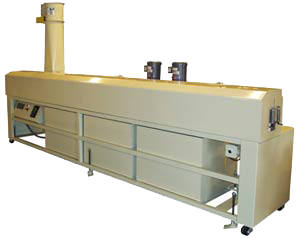 This is a short hot water wash system for a small extrusion line. Special nozzles on the inside of the unit totally flooded and encompassed the extrusion for high pressure cleaning with minimal overspray. 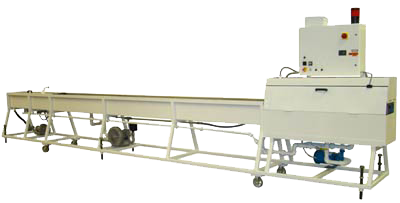 This is a 3 stage hot water wash system used on a salt curing line but in conjunction with a salt recovery system. After achieving a high concentration of salt water in the first stage the water was transferred to a recovery or an evaporation system and the water in the subsequent wash stages was moved forward one stage, thus maintaining clean water in the last stage for final cleaning of the product.